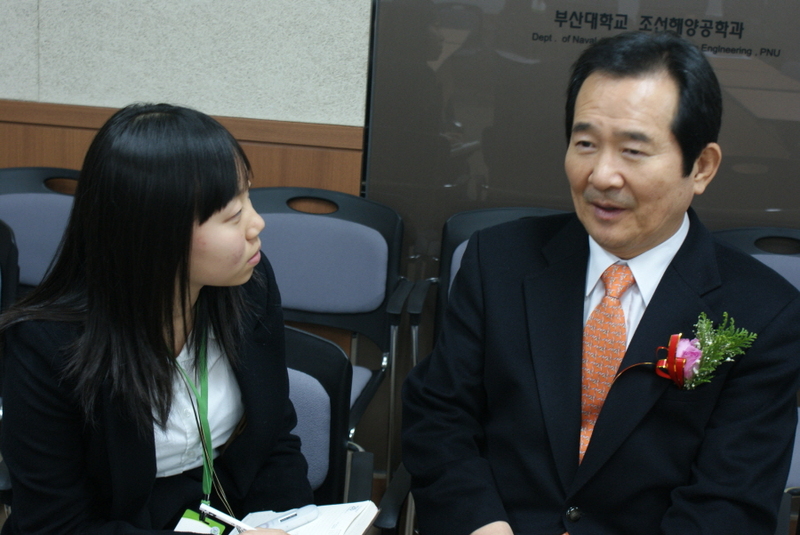 Ed- On November 21st, the President of the Democratic Party, Chung Sye Kyun interviewed with the Hyowon Herald. On that day, he held a special lecture on criticizing the Four-River Restoration Project. He insisted that the budget for the project should be invested into the welfare of the people. After the lecture, Mr. Chung had a seminar with a few professors and met with student representatives. He calls himself a policy- oriented politician. He has developed his political career mainly in the field of policy. So, he has interests in most policies over all. As Chung had been in the business world, he is deeply informed about economy related problems. As he was once a member of the education committee, he also has interests in the problems of students. So he could talk about problems regarding cutting registration fees and education with students. Mr. Chung insists that students contact with their local political representatives. Contacting politicians is the beginning to solving problems regarding quality of education and tuition fees. In other words, participation of university students in politics is important. He believes that large numbers have strong power. There are many universities in and each school has many students. Chung Sye Kyun stands for so-called communication politics. He visited PNU for two-way communication. In that he made such effort, he can be regarded as a model to other politicians.